Summary Judgement: Nexus: Ascension deftly weaves post-apocalyptic storytelling with space opera to produce a unique novel that explores the depths of tragedy and the limits of hope. 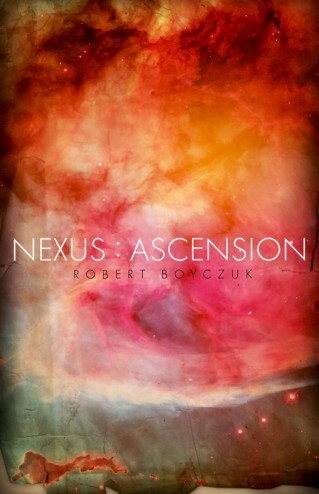 Robert Boyczuk offers a supremely intriguing story in Nexus: Ascension. Set in a far-flung corner of the galaxy where human life exists on multiple planets, the novel charts the fate of the starship Ea. The Ea’s crew, upon returning to their home planet of Bh’Haret from a thirty-year trade mission, emerge from stasis to find a strange network of satellites orbiting their world. Blocking all transmission in and about Bh’Haret, the satellites scream two words, over and over, into the void “plague hazard”. Low on food and fuel, the Ea’s crew land on Bh’Haret only to find cities pockmarked with radioactive craters and human life seemingly extinguished. And did I mention that all this happens within the first thirty pages? To say that Nexus: Ascension has a convincing hook is to understate the robust narrative that Boyczuk generates with his words. Nexus: Ascension is no simple story of survival. Indeed, that is one of the strengths inherent to Boyczuk’s style. He constantly plays with preconceptions that readers might be bringing to the table. Each time the plot approaches a cliché of the post-apocalyptic genre it changes pace just enough to keep a reader on their toes. While I wouldn’t go so far as to say that the book plays in plot twists, it is keenly aware of the need to be unexpected when treading down the familiar literary path of planetary catastrophe. Allow me to illustrate the point: Nexus: Ascension isn’t content to merely have its characters lament the loss of their world while they get on with the business of survival. Rather, the book unrepentantly explores loss as a psychosis so strong that its characters are constantly courting insanity. On its own, that idea might not seem overtly avant-garde. Yet, maintaining a believable malleability in the characters’ sanity without reducing them to blithering idiots, cannibals or other tropes of madness is quite a feat. Arguably, the novel’s tableau of coping skills, which quite naturally put me in a place to ask what I would do in a similar situation, is one of its most accessible qualities. Much to my surprise, the novel’s tendency to explore the mental state of its characters in no way slows the pace of the book. One of the ways Boyczuk ensures the tempo of his novel is in resisting the tendency to provide detailed exposition. Equal measures of sharp dialogue and rich environments drive the plot rather than merely elaborating on it. Indeed, as the story transitions from survival narrative to space opera, I appreciated that the writer focused on the events at hand rather than the pointless details of fusion engines, laser pistols and other such sundry sci-fi gizmos. This shouldn’t suggest that the book deserves being labelled as soft sci-fi. All events within the book unfold according to the rules of physics as we currently understand them. Thus, avoiding excessive details therein assumes a level of sophistication from the audience in addition to grounding the text in the human condition. Despite the aforementioned strengths, the character development within the book isn’t quite perfect. There are a couple of religious kooks within the book that serve no real purpose, not withstanding their occasional prognostications of doom. Additionally, there are times when it seems that some of the main characters, in particular Ea’s captain, Sav, are a little shallow. However, the more I read into the book, the more I came to recognize that this shallowness was not a failure on the author’s part. Rather, these occasional moments of character hollowness were a reflection on the fact that the book’s characters find themselves constantly reinventing who they are to suit the moment in which they live. In retrospect, this is an interesting way of exploring self-identity when everything that defines a person and their place within a society has been destroyed. While a very bold gambit for subtextual exploration, it is one I fear that some readers may misinterpret. Further criticisms of Nexus: Ascension are few and far between. As the story develops, the focus splits from one inclusive plot line to two separate threads. The segment wherein my favourite character dwells ended a bit more abruptly than I would have liked. Of course, a complaint such as that speaks more to Boyczuk’s ability to draw me into the story than it does any fault in the writing. Also, the characters’ relationship toward cybernetics is as thought provoking as it is frustrating. While it all makes sense within the context of the story, I felt a desire for a greater understanding of the relationship between the cybernetic “facilitators” and their role within Bh’Haret’s nation states. Again, it’s another criticism that speaks more to how the book tapped into my fascination with post-humanism than any failing in the narrative. As a study in human emotion and a first rate space opera, Robert Boyczuk’s Nexus: Ascension is so unique that it defies easy comparison. It is also a bold story in that it dares to have individual characters honestly grapple with the end of their world. Short of the sheer physical exhaustion that comes with reading late into the night, it was almost impossible to find a reason to put this book down.